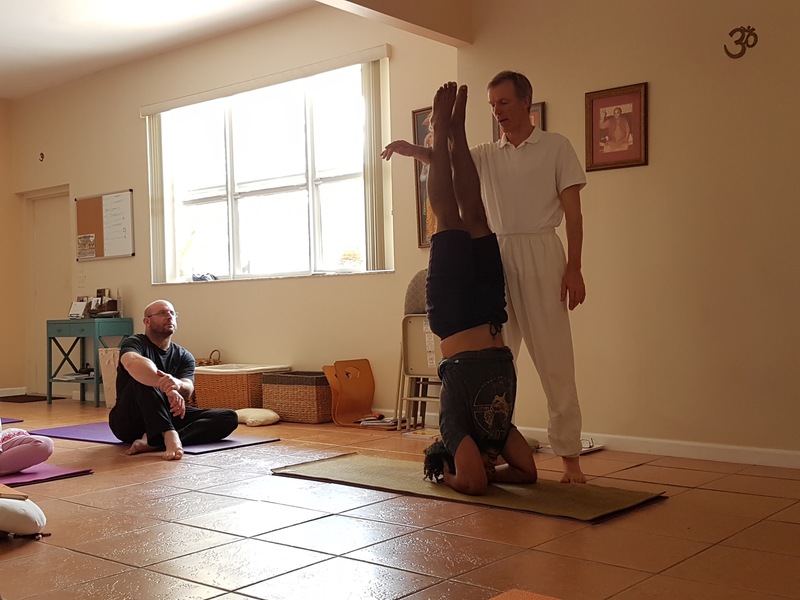 Yogi Hari’s Ashram was recently featured in a popular magazine in Brussels, thanks to Hans-Maarten Post who took the 200-hour Teacher Certification Course this past April. In it, he beautifully describes his experience at the ashram and his process of assimilating the knowledge he gained during the course. Enjoy! It is six o’clock in the morning and still dark outside. Here I am, sitting on a pillow on the floor. In front of me, on a small white stage, a funny looking Indian guy with a white beard and a white cap, sitting behind a harmonium. He tells me I have to focus on the point between my eyebrows and that I will feel a slight pulsation there. But all I can think of is… coffee! Sitting around me are Jesse, a bartender from Puerto Rico, Gerardo, a Mexican truck driver from Texas, Natalie, a cook on a luxury yacht, and Lina, a television producer from Miami, plus a handful of other people. It will be another four hours before I will see anything remotely looking like breakfast, my legs hurt and I can not concentrate. So, why again did I decide to come here? Because I was foolish enough to think I could become a yoga teacher. And that I wanted to learn from the best. It is this rashness that brought me from Belgium to Miramar, near Miami. To this 71 year old wise man. Shri Yogi Hari, one of yoga’s best kept secrets. A man who has gathered tons of wisdom and, at his advanced age, still is willing to share all that knowledge. Someone as well who doesn’t care about publicity, and therefore is not quite as well-known as he could be. He grew up poor in Guyana, back then still a British colony. He worked as a land surveyor, measured up land for millionaires on the Bahamas until he became ill and discovered yoga through his wife. It made him change his life completely, wanting to go and study with a couple of true Indian Yoga masters. For years, he not only studied yoga, but also mastered the music that is inextricably linked to it. And so it happens that I can hear myself sing Jaya Ganesha, Jaya Ganesha, on this early morning. Yogi Hari sings first, accompanying himself on that organ-like sounding harmonium, and we repeat after him. It feels good, strangely enough. I think of my colleagues at the newspaper, behind their computer. They should see me, sitting here. Singing. Hearing myself makes me smile. Me? Singing? It is something I don’t even do under the shower. Yogi Hari must have seen my grin because he immediately cautions me. “Keep your focus! This is no entertainment! This is a follow-up to meditation. Singing helps you to concentrate.” And right he is. When he sings six words, I can barely remember three, because my mind is already somewhere else. It quickly becomes clear to me that getting this certificate will not be a walk in the park. Because this is how it will be over the next two weeks: up at five o’clock, at six meditation, chanting and lecture, at eight o’clock two hours of yoga, at ten o’clock breakfast and at eleven o’clock karma yoga. From twelve to two we’ll have time to study, then we get two hours of yoga instructions, followed by another yoga session from four till six. At six o’clock we have dinner, and from half past seven to ten we will be chanting, followed by the main lecture. What is karma yoga, somebody asks, when that daily schedule is given to us. 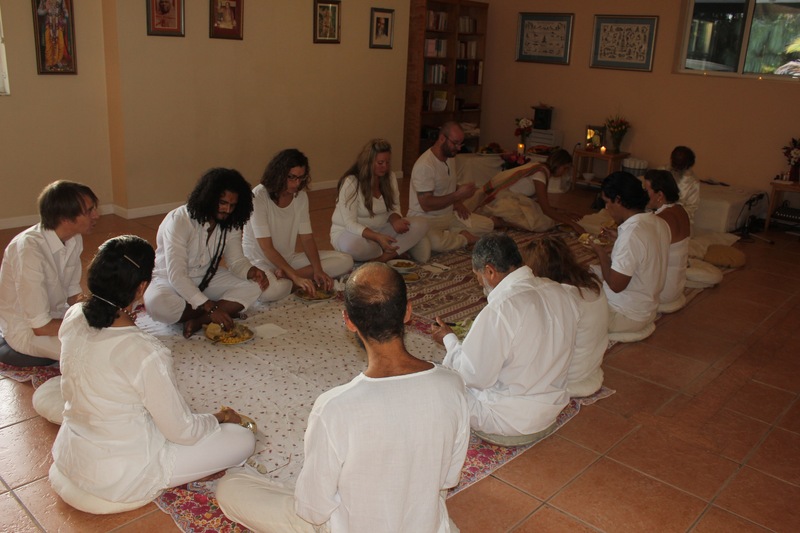 It turns out that each of us, in the spirit of the selfless service that is so important in yoga, is expected to do something in the household of the ashram, for an hour a day. Be it cutting vegetables for dinner, cleaning the bathrooms or working in the vast garden. When I follow Yogi Hari into the lush green, that first morning, I’m not only seeing lots of vegetables, I also notice things hanging in trees that I have never seen before. Tamarind, for example, or aki fruit, from the Caribbean. There are mangoes, bananas, and some two hundred lynchee trees. Underneath those I will weed, the next few days, but today somebody puts a shovel in my hands, as a couple of sugarcane roots need to be dug out. After barely two minutes I’m sweating heavily, under the burning Florida sun. Impossible to get those damned things out of the soil. Afterwards, when the work is done, small chunks of sugar cane are distributed to chew on. “The best snack!” says Yogi Hari. And right he is. Although I’m sure that even the sole of a shoe would have tasted good at that moment. But, yoga. During his first lecture, the wise yogi with the white beard immediately guides us into the right direction. “Yoga is much more than some strange poses, as most people think. But this is the way of the world: we all want everything instant.” He spurns hip versions such as bikram and power yoga, and tells us about all the things his yoga of fullness comprises. About how he came to this all encompassing system that he called Sampoorna Yoga. And we all better pay close attention to what he is saying, as each of us will not only have to teach a yoga class quite soon, but we will also have to take a written test about his lectures, at the end of our stay. For the yoga classes, guruji – that’s how you address him – can count on one of his loyal disciples. Rama, who is actually called Bernhard, has his own yoga studio in Oldenburg, Germany. After one session I’m perplexed: I sure have had some pretty bad teachers, in the fifteen years that I’ve been doing yoga. People who clearly did not know what they were doing or what they had to pay attention to. Rama shows us what we have to focus on for each pose, and shows us exactly how we have to correct our future students. Soon he gives us a first exercise to work on with another student. What happens next, feels rather discouraging. I see other students confidently correct a colleague, but when I suddenly feel all eyes on me, I do not only forget what I should be saying, but my voice seems to have disappeared as well. “Speak louder, Hans!”, Rama says. It doesn’t predict much good. When a lesson or so later we start to realize how many things we have to think of if we want our yoga lesson to be any good, I panic. In a few days time, I’ll have to teach that myself? So yes, we all have the greatest respect for Tommy, my roommate, who volunteered to teach that first class. 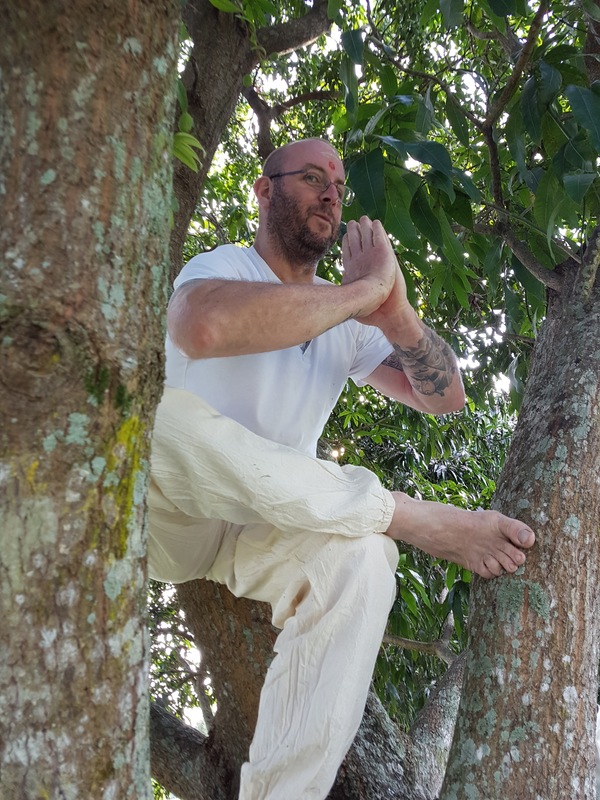 He was in the US Army, worked as a police officer, lived three years with his karate master in Beijing, and is currently teaching at a massage institute in Indianapolis. He has a confidently sounding voice and knows all the right tricks to make our sometimes slightly grumpy guruji smile. During his lesson he forgets almost half of what he has to teach – quite understandably – but I’m amazed by his confidence and how at ease he seems to be, teaching. “Be Tommy!” I plan to make that my mantra, to try and give myself some courage, on the day it will be my turn. Two lectures and three yoga sessions a day … It becomes more tiring day after day, but more interesting as well. I especially appreciate each session with Yogi Hari playing the harmonium, singing. It feels as if I’m getting an intimate concert with the purest Indian music as a bonus during this course, twice a day. As a man looking for ways to add more meaning to his life – the year long quest I’ve embarked on for my newspaper back home – I slowly become impressed too. I had already made a resolution to seek the company of wise, preferably slightly eccentric people, and with Yogi Hari I have somebody just like that sitting in front of me every morning and every evening. Not that I’m always able to understand him or his sometimes just too happily smiling disciples, and not that I follow him in all that he is explaining to us (the whole reincarnation thing), but I am amazed by his erudition and the way he easily connects one thing with the other. Christianity and Hinduism, for instance and how, in the end, it all doesn’t matter that much. Everyone is listening intently, every time again, when he is philosophizing or simply telling his often funny personal stories. Even yet if many of the things he is telling might seem obvious. How we human beings are greedy, but lust for the wrong things. How money and pleasure will not make us happy, nor will power, and how piece of mind will help us much more. About why it is that we mostly pursue two of the most volatile things on this earth: eternal youth and wealth. How eventually we are all the same and we get lost believing in all the things that veil that sameness, such as age, skin color, gender and faith. How everything comes down to two key concepts: right discrimination and right association. The ability to distinguish what is good for you, and what not, and the intelligence to link yourself to just the right things. 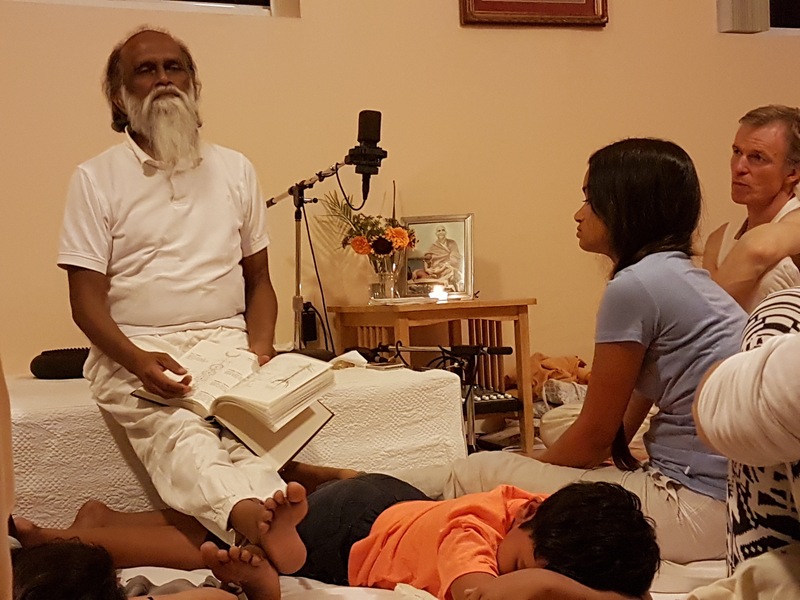 He tells us that surrendering yourself to yoga and everything that is related to it does not mean that you have to shut yourself off from the world, but that, on the contrary, you should use all your talents to make it in this world. I smile when he shares with us another of his nicely formulated quotes: be friendly to the happy, have compassion with the unhappy, revere the holy, and be indifferent to the wicked. And then the moment has arrived. My turn to teach. I’ve been thinking myself to sleep the past days, going over the correct order of all the postures, again and again. Trying to make sure that I won’t forget a single one. I’ve sat down on the grass between the lychee trees in the afternoon to practice my instructions aloud so it won’t feel strange, hearing my own voice, and I won’t get confused, talking while going into the different poses. 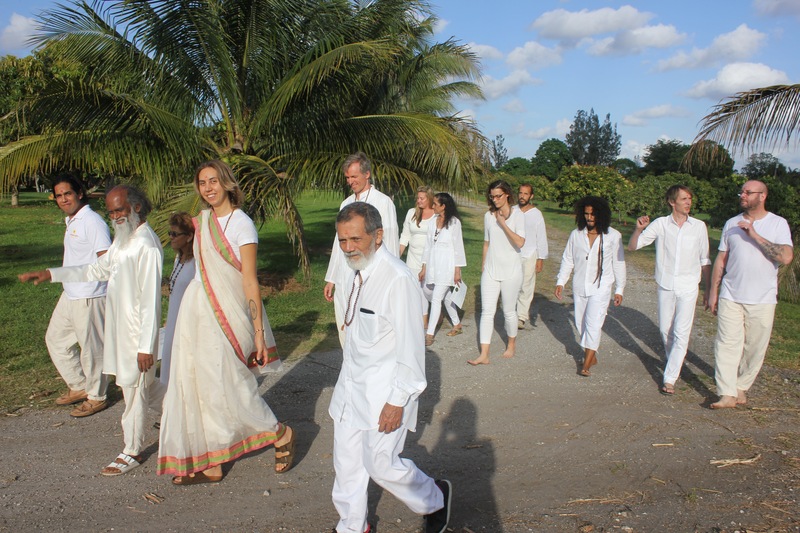 I put on the white clothes that they prefer you to wear as a yoga teacher over here, and smilingly I repeat to myself: Be Tommy! I feel my heart beating when I see my students roll out their mats. I feel the first drop of sweat on my forehead as I speak my first words, but at the same time I notice a feeling of confidence when I breathe in, for the “om” that signals the start of a yoga lesson. Here we go! My mind is going in overdrive: trying not to forget a single thing, finding the right words in English for what I want to say, keeping an eye on everyone in the room and correcting them, if necessary, and… am I talking loud enough? When I panic because I’m not sure what is next, I luckily see only smiling faces in front of me. It’s hard work and after fifteen minutes my T-shirt is wet, but at the same time I feel a kind of calm happiness when I look into the classroom. Actually, I like this very much. The guy who wanted to add more meaning to his life is happy. Because this is what I have come to America for. Finding an answer to the question whether becoming a yoga teacher would be something for me. I smile when I feel the answer in my body and in my mind. Hearing the comments of my class afterwards, makes me very humble. Hero Tommy is talking about how he had noticed how nervous I was the previous days and says that I have hit the ball out of the park, using a baseball expression. He loved my class. I’m afraid of what Rama, always a stern teacher, is going to say, but he seems to be pleased as well. He did not expect that my voice and personality would fill the room as they did, he compliments me. And Roberto, sixty-one years old, from Venezuela and already working in a yoga center as a teacher, keeps it simple. He smilingly puts ten fingers up in the air. I am truly moved. When I’m back in Belgium a few days later, it all seems very unreal. Even though I have the certificate, with the golden seal that proves the opposite: from now on I’m allowed to call myself a yoga teacher. I’m returning to my old routine, but I feel that I’ve changed in ways that I’m not able to fully understand yet right now. I miss the warm friendship of my fellow students. I think fondly about some of the things that seemed strange to me at first. The bell announcing every new episode of the day in the ashram. Standing around the table before breakfast or dinner, all together, hand in hand, singing before we fill our plates. Or that eternal hot bowl of kitcheree for breakfast. 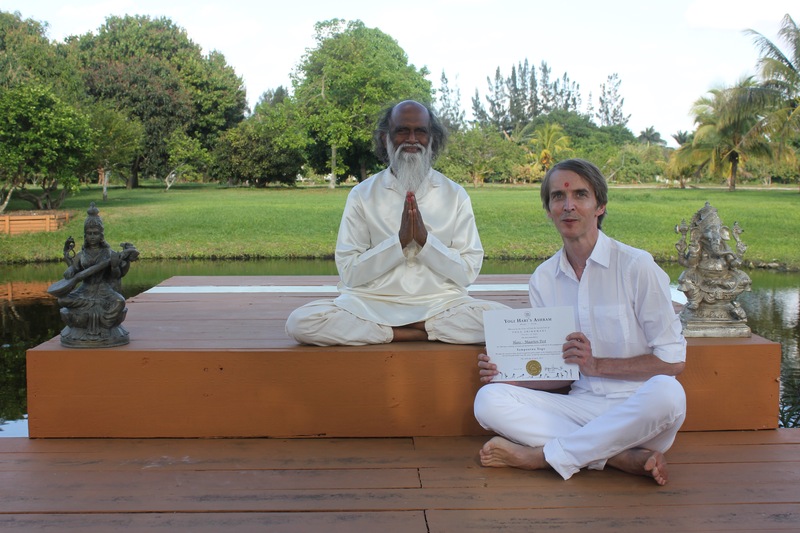 I have to think of the beautiful moment when I received my diploma from Yogi Hari, sitting on my knees in front of him. He sprinkling with a rose some water droplets over me, then drawing a red dot on my forehead and looking at me intrusively, saying: It was nice having you here. I feel more awake than ever and am amazed: I had expected to feel my weak back protesting, during those two weeks of intensive yoga. But no. Not at all. After two days sitting in my car and in my office chair, my back starts to hurt immediately. I makes me think of another of guruji’s jokes: “If we needed something like a chair, we would have been born with one on our back.” Yes, I’m singing along with his CD’s in my car and each every time when I encounter something that could possibly bother me, I make it go away with one of the favorite, funny sayings of my wise Yogi. There’s no limit to stupidity. I walk through the world with a different feeling. Think good, do good, get good.